Entry is into a comfortable, dimly-lit, low-ceilinged space, clearly once divided up but now mostly opened out. To one side is a area with bookshelves holding actual real books, while further back is a raised area with a much brighter feel thanks to two large skylights as well as windows looking out onto the garden. The flooring is wood, covered with large patterned rugs. Black and white photos of the local area — both modern and vintage — hang on the walls, and additional interest is provided by architectural features — again both modern and vintage — such as stained leaded glass in a "rose and crown" motif and an end wall covered in ornate tiles. Out the back there's a good-sized garden; part grass, part flagstone, and part covered, with long booths to one side. Kake visited on a Monday lunchtime in January 2019. Arriving at their opening time of noon, I was the only customer, though a couple of others turned up while I was there. Service was friendly and helpful. Retro music was playing, not too loud. The handpumps were clipped for London Pride, ESB, and Dark Star Hophead. A pint of lime and soda was £1.05. 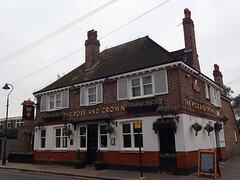 According to the Rose & Crown website as of January 2019, food is served noon-3pm and 5pm-9:30pm Mon-Thu, noon-9:30pm Fri-Sat, and noon-9pm Sun. As well as the main menu photo, they also offer a set-price lunch menu on weekdays between noon and 3pm photo; Kake decided to go for the latter, at £12 for two courses. Salt & pepper squid photo was a bit flavourless, and could have done with more seasoning, but had a good texture — not tough at all — and the smoky mayo on the side was if anything slightly oversalted, so it balanced out in the end. The coating was nicely crispy but didn't adhere as well as would have been ideal. It was quite a generously-sized portion for a starter on a set-price lunch menu. Wild mushroom and spinach gnocchi photo was very good. The gnocchi themselves weren't gluey at all, and were cooked soft yet still with just a little bite to them. The cream sauce was beautifully mushroomy, and there were plenty of actual mushrooms in it too, ranging from small enoki-like ones to large meaty ones, which along with the spinach made a good textural contrast to the gnocchi. If I were being picky, I'd have preferred a little less sauce, since there was more than necessary and it made it a little messy to eat, but overall I was very pleased with this dish and would order it again. It was again a generous portion, and quite rich, and I only managed about two thirds of it. Kake's verdict: I'd definitely come back for a weekday lunch if I was in the area, given the good value in terms of both quality and quantity. Accessibility: Step-free at the side entrance (a step to get in at the main entrance). Once you're in, there's a step to the seating at the back, from which the garden is accessed, but no steps to the toilets, including a RADAR-locked accessible one. Last visited by Kake, January 2019. Opening hours taken from the Rose & Crown website, January 2019. Last edited 2019-03-04 10:58:10 (version 10; diff). List all versions. Page last edited 2019-03-04 10:58:10 (version 10).